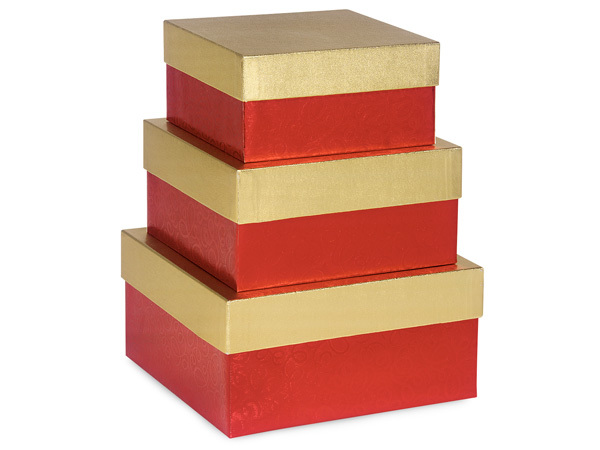 Large Embossed Red Swirl with Embossed Gold Lid Nested Set of 3: Inside Dimensions- Small 6" x 6" x 3"; Medium 7" x 7" x 3-1/2"; Large 8" x 8" x 4". Outside Dimensions- Small 6-1/4" x 6-1/4" x 3-1/8", Medium 7-1/4" x 7-1/4" x 3-5/8", Large 8-1/4" x 8-1/4" x 4-1/8". Combine with small set to make a 6-piece tower! Made in the USA.